Chances are that you’ve heard the phrase “functional foods,” but maybe you aren’t sure just what it refers to. Rest assured that most functional foods are not foods created in a laboratory somewhere, but instead are many of the foods you probably eat every day. A formal definition of a functional food is a food or component of food that may supply a health benefit in addition to the basic nutrition it provides. For example, milk, which naturally contains calcium and is fortified with vitamin D, promotes bone health and is a functional food, as are all the antioxidant– and fiber-rich fruits and vegetables you eat. Salmon and other cold-water, fatty fish qualify as functional foods thanks to the heart-healthy omega-3 fatty acids they contain. Some newcomers to the functional food market include enhanced products such as calcium-fortified orange juice, margarines that contain added plant stanol and sterol esters (natural ingredients that can help lower blood cholesterol levels), and some popular sports drinks and energy bars that feature added vitamins, minerals, and other substances. All of the foods mentioned above contain nutrients or ingredients that promote health in some way. In addition to familiar-sounding vitamins, minerals, and fiber, functional foods often contain some strange-sounding ingredients, such as resveratrol, polyphenols, lycopene, and proanthocyanidins. While such ingredients may sound like harmful chemicals, they are actually substances that can help maintain good health and even fight many common diseases, such as heart disease, high blood pressure, and some types of cancer. The table “Functional Foods at Work” has a few examples of how common, everyday foods may protect us from disease and keep our bodies functioning properly. While many functional foods can definitely be part of a healthy eating plan, some food manufacturers have developed certain types of functional foods that are not necessarily good for us. For example, many of the fortified energy bars on the market are about as nutritious as a candy bar. Although they may contain a handful of added vitamins and minerals, these bars often have just as much fat and sugar as your favorite chocolate bar. Some beverages, such as bottled iced teas that contain certain herbs, may sound like a better choice than regular iced tea because they promise to increase your energy or your “brain power.” In many cases, however, they contain the same amount of sugar and calories as regular iced tea. In addition, because there is no regulation over how much of an herb a manufacturer can put into a particular food, there’s no guarantee that you would reap a health benefit from drinking it. The majority of fortified functional foods have not been tested for safety, let alone functionality. And while government regulations force manufacturers to divulge the amount of nutrients (including vitamins and minerals) they put into their products, there are no such regulations for herbs and other supplements, such as amino acids. Too much of a particular herb or supplement can be harmful. Functional foods containing these ingredients may even potentially interact with medicines, leading to serious side effects. The best way to benefit from “nature’s own” functional foods is to eat foods in their natural state. In other words, following a meal plan consisting of fruits, vegetables, whole grains, lean protein, and healthful fats is one of the best ways to stay healthy and arm yourself against illness and disease. It’s important to note that functional foods are not magic bullets – they can’t make up for a diet that’s high in saturated fat, for example, or a lifestyle that includes smoking, excessive alcohol intake, or chronic inactivity. You don’t need to become an organic farmer or shop at a natural foods store to take advantage of the benefits offered by the multitude of healthful foods. Your local grocery store likely carries all that you need. Let’s take a tour of the grocery store to see what we can find. First, spend some time in the produce section of the store. All fresh fruits and vegetables offer some kind of nutritional benefit, so the key here is to choose a variety. To make it easier to choose, try to eat different-colored fruits and vegetables every day – red, yellow/orange, green, blue/purple, and even white – since each color contains specific, health-promoting phytochemicals. Fresh produce is rich in antioxidants, fiber, and other substances that are necessary for good health. What about canned or frozen produce? 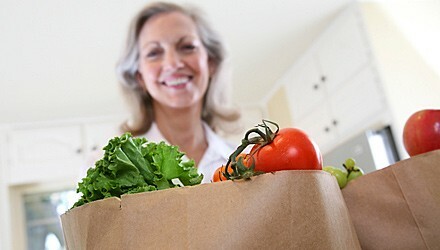 If fresh produce isn’t available or seems too expensive, canned or frozen will do. In fact, plain frozen fruits and vegetables are usually highly nutritious, because the freezing process helps them retain nutrients. Select frozen fruit that is not packed in syrup, and avoid frozen vegetables packaged in butter, cream, or cheese sauces. When preparing canned vegetables, rinse them to remove some of the sodium, or purchase canned vegetables that contain no added salt. If you buy fruit in a can, get the kind packed in water or its own juice rather than in syrup, and drain off some of the juice to reduce the amount of carbohydrate. Next, stroll down the bread aisle and look for breads, rolls, and crackers that list whole wheat or another whole grain as the first ingredient on the label. Whole grains naturally provide fiber, vitamins, and minerals and have been linked to reduced risk of heart disease and some cancers. Also try whole wheat pasta, brown rice, bulgur, millet, or barley as alternatives to potatoes, white rice, or regular pasta. And don’t overlook the healthful choices in the cereal aisle – experiment with steel-cut or old-fashioned oats (for a healthy dose of cholesterol-lowering soluble fiber) or a whole-grain cereal for breakfast. Now, on to the dairy section. Some eggs are fortified with omega-3 fatty acids, a type of fat that may help protect against heart disease. (These eggs don’t supply nearly as many omega-3 fatty acids as a serving of fatty fish, though.) Milk is an excellent source of calcium and is one of the few foods that supply vitamin D (calcium and vitamin D are nutrients essential for good bone health). Choose nonfat or low-fat milk to limit your intake of saturated fat. If you can’t tolerate milk because of lactose intolerance (the inability to digest the sugar in milk), yogurt may be an option for you. The bacterial cultures found in yogurt produce some of the enzyme needed to digest lactose, making yogurt easier to tolerate. Look for yogurts that contain “live and active cultures,” which should be indicated on the container. Common bacterial cultures found in yogurt are helpful in keeping your digestive tract healthy. Soy milk and soy yogurt are healthful alternatives to cow’s milk and yogurt, too. Components of soy products may help protect against heart disease, some cancers, and osteoporosis. Pay a visit to the spice aisle. Many spices and herbs, including oregano, rosemary, turmeric, cumin, and garlic contain antioxidants, powerful ingredients that pack a punch when it comes to fighting against diseases like heart disease and cancer. Regular consumption of cinnamon has even been shown to lower blood glucose and blood fat levels in people with Type 2 diabetes. Finally, take a walk down the beverage aisle of the grocery store. Cranberry juice may help ward off urinary tract infections and was recently found to help reduce dental cavities (although the added sugar in most cranberry juice cocktails may counter this effect). Purple grape juice contains flavonoids, which may help reduce the risk of heart disease, lower blood pressure, and limit the formation of blood clots. Keep in mind, however, that fruit juices tend to be high in calories and carbohydrate. Eight ounces of cranberry juice cocktail contain about 35 grams of carbohydrate. (Pure cranberry juice is lower in carbohydrate, with about 16 grams per 8 ounces, but is very tart and can be difficult to find outside of natural foods stores.) Eight ounces of grape juice contain about 40 grams of carbohydrate. One option is to try light cranberry juice cocktail (8 ounces contain only 10 grams of carbohydrate) and light grape juice cocktail (8 ounces contain 18 grams of carbohydrate), which are sweetened with artificial sweeteners. If you’re a tea drinker, you’ll be happy to hear that black tea is rich in polyphenols, which may lower your chances of heart disease. If you prefer green tea, you’ll be happy to hear that it is an excellent source of catechins, compounds that may help lower cancer risk (including ovarian cancer) and heart disease. Craving chocolate? Enjoy a cup of hot chocolate on a cold winter’s day – the milk will help strengthen your bones, and the cocoa, which has even more antioxidant properties than tea, may help stave off cancer and keep your heart healthy, too. What is a health claim? In 2002, the FDA decided to allow “qualified health claims” for some foods, in cases where the scientific evidence for the claim outweighs the scientific evidence against it. Three of the most recent qualified health claims involve walnuts, omega-3 fatty acids, and monounsaturated fat from olive oil. In early 2004, the FDA determined that eating walnuts may reduce the risk of heart disease when consumed as part of a low-saturated-fat and low-cholesterol eating plan, as long as calorie intake is not increased. The recommended amount of walnuts is 1.5 ounces a day. Later in 2004, the FDA issued the following qualified health claim for omega-3 fatty acids: Supportive but not conclusive research shows that consumption of EPA and DHA omega-3 fatty acids may reduce the risk of coronary heart disease. One serving of [name of food] provides [x] grams of EPA and DHA omega-3 fatty acids. [See nutrition information for total fat, saturated fat, and cholesterol content.] EPA and DHA are types of omega-3 fatty acids that are found in oily fish such as salmon, lake trout, tuna, herring, mackerel, and sardines. The American Heart Association recommends eating fish at least twice a week. Also in late 2004, the FDA announced the following health claim for monounsaturated fat from olive oil and reduced risk for heart disease: Limited and not conclusive scientific evidence suggests that eating about 2 tablespoons of olive oil daily may reduce the risk of coronary heart disease due to the monounsaturated fat in olive oil. To achieve this possible benefit, olive oil is to replace a similar amount of saturated fat and not increase the total number of calories you eat in a day. One serving of this product [name of food] contains [x] grams of olive oil. While olive oil is a heart-healthy fat, remember that it still contains a lot of calories (1 tablespoon has 120 calories), so be sure to consider portion size, and substitute it for other fat choices in your eating plan. Not all health claims submitted to the FDA are approved. A proposed health claim that linked green tea with a reduced risk for certain types of cancer, for example, was not approved in 2005 after the FDA determined that not enough evidence existed to support this claim. Even more recently, the FDA prevented producers of tomatoes, tomato products, and dietary supplements from claiming that the lycopene (a type of antioxidant found in tomatoes) in their products may prevent prostate cancer. However, the FDA will allow packages of tomatoes and tomato sauce to state that eating one-half to one cup of tomatoes and/or tomato sauce a week may reduce the risk of prostate cancer. Fitting functional foods into your eating plan (and your family’s) is easier than you think. If you’re not used to eating whole-grain bread or if the only fruit you eat is apples, for example, you might feel a little overwhelmed at first, but the key is to incorporate more healthful foods into your eating plan gradually. Be adventurous – experiment with one or two new foods every week. You may decide you don’t like whole wheat pasta, but perhaps brown rice will become a new staple for you. Below are some tips to get you started. Make a list and check it twice. Take stock of your pantry and refrigerator. Are you already choosing whole-grain cereals and eating a lot of green vegetables? Great! Keep up the good work, but be willing to try some new foods. Take it meal by meal. Get a head start on the day by eating a breakfast rich in functional foods. Oatmeal or whole-grain cereals with milk, low-fat bran muffins, whole-grain waffles or pancakes, yogurt, and fresh fruit are all excellent choices. Polish everything off with a cup of hot tea or sugar-free cocoa. For lunch, consider bringing leftovers from last night’s supper. Or grab a sandwich on whole-grain bread, vegetable soup, or vegetarian chili. At the salad bar, go for the dark, leafy greens, and throw some chickpeas or kidney beans on your salad. 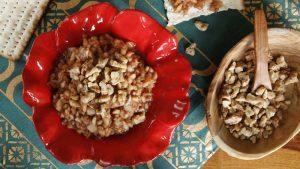 Top it off with just a sprinkling of sunflower seeds or walnuts. Drizzle everything with an olive-oil—based vinaigrette dressing. If you snack during the day, choose fresh fruit and a small handful of nuts or seeds, or try spreading a small amount of peanut butter on an apple or half a banana. Other snack ideas include nonfat or low-fat yogurt, whole-grain crackers, and light popcorn. Be smart at supper by substituting brown rice, quinoa, or another whole grain for white rice or potatoes. Try whole-grain pasta with a low-fat marinara sauce, or whip up a stir-fry using tofu instead of meat or chicken. Aim to include two different-colored vegetables in your meal, such as broccoli and carrots or spinach and yellow summer squash. Keep portions in check by picturing your plate: About half of your plate should be filled with vegetables, a quarter of your plate should be covered with some kind of carbohydrate food, such as a starch or a fruit, and the other quarter of your plate should covered with a lean protein food (fish, poultry, lean meat, or tofu). If you crave dessert, fresh fruit is best, although canned fruit in juice is also a good choice. Frozen fruit juice bars are another good way to sneak fruit into your eating plan. (Don’t forget to count your carbohydrates!) Relax in the evening by sipping a cup of hot tea (go for decaf if caffeine keeps you awake). Functional foods can do double duty – they provide you with the fuel you need for daily living and can help protect your heart, bones, digestive tract, and other parts of your body from disease, too. Most of them are foods that you already know are good for you and that are easy to find at your local grocery store. Add some functional foods to your meal plan today! Amy Campbell is the former Education Program Manager, Office of Disease Management, at the Joslin Diabetes Center in Boston, Massachusetts.